No one can outrun their destiny, but just whose destiny was she running from? Nobody said being the hero would be easy but is Leo dragon enough to play the part? To ask other readers questions about Fated Magic, please sign up. So! Leo. The spunky young dragon we all know and adore. She has come a long way since first meeting Gabe in the coffee shop, when her life was turned upside down. She has grown greatly in her magic and formed unbreakable bonds with those around her; for the first time, she has a whole team of magical people on her side, fighting the good fight right alongside her. But her greatest battle to overcome, I think, is her fear of the unknown. She still hesitates to see herself as the "Great Pink Dragon" everyone around her assured her she is. On top of that, there is great and terrible secrets being kept from her—magic being used against her without her knowledge. And these secrets will turn her life upside down, once again. 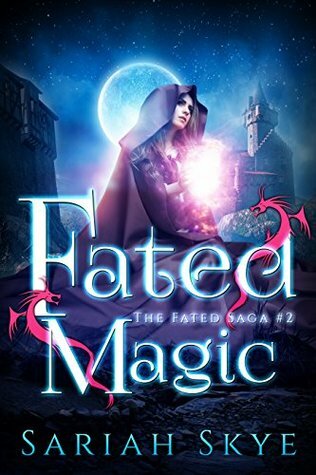 So much has been kept from her for her entire life, but nothing has shaken her like the trials unraveled in "Fated Magic." Our young Leo still has a LONG ROAD ahead of her. And since this is a series, you need to read FS before coming to the second book! Fated Magic picks up right where we left of at the end of Fated Souls.Leorah and her friends are at Castle Danger, where Leo is trying her best to train and prepare herself for the upcoming fight and danger.Leo has to cope a lot with the fact that her life has drastically changed.She has always been pushed to the edges of the dragon society and had resigned herself to a simple, ordinary life in the human world before everything changed for her. Now she has been thrust into the role of savior and she has to deal with the fact that she is more special than she realised.But it takes a lot to overcome years of conditioning and mistreatment, and to come to terms with the fact that being a pink dragon isn't something to be ashamed of. She can fly and has her own special brand of magic with abilities that she is still discovering.I'm so glad the author hasn't made her a Mary-Sue ish character.Leo has her own sets of strengths and weakness.She is portrayed in a realistic manner. There isn't really a love triangle here because Leo is quite clear about what she wants halfway through the book and never leads anyone on.I'm glad that Gabriel didn't undergo a complete character transformation, such that we'd hate him and root for the other party,like some authors make us do.He still remained helpful, loyal and caring albeit annoying at times. The supporting cast of characters including Daniel, Kiarra and Leo's family was quite amazing.The mystery is compelling and I really couldn't put it down! This one picks up right where Fated Souls ended. and continues to follow Leorah and her band of friends on their journey to save the Dragons from the Shadows. I really enjoyed this one more than FS and I loved learning more and more about Leorah and Max's past as well as their hidden abilities. If you liked the Fated Souls then you're going to love Fated Magic. Sorry no spoilers of any kind because I’m not the type that does that. So this is all I’m going to say about this book and that is I thought it was absolutely awesome! Each book that I read of Fated series by Sariah Skye so far just seems to get better and better. Each book is addicting as heck I think since I had problems putting the first book and putting this book down once I started reading them. And I like that, that a author was able to do that. Sariah Skye is definitely a gifted story weaver. I look forward to reading more of her books in the future. So if you haven’t figured it out that is a big HECK YEAH I most definitely recommend this book but if you haven’t read the first one then I highly suggest that you do otherwise you’ll get pretty confused as to who’s who and what’s what. Leorah and her band of misfits return in this follow-up to Fated Souls. You go through so many feels throughout this book. You hurt for Leo and Maxxus. You laugh at Daniel and his wit. You ache for Gabriel. You continue to be confused by Finn. The reunions, the apologizes, the action! Skye did this book right! Look forward to book 3! I found this really hard going. I just can’t continue the series. I’m pleased I managed to finish this one. Loved the first one love this one ....leo is amazing love the way this turn out and the cliff hanger you have me wanted more can't wait for the next book what going to happen to everyone will Leo be able to save them all ? This is the second book of the series and doesn't disappoint its readers. Truly enjoyed this book! So glad someone talked me into the series!